Please remember that in New Age panentheistic theology (such as professing Christian Rob Bell espouses), the only one who cannot and will not be tolerated who is the "intolerant" Christian who makes exclusive truth claims about: the way of salvation being through Christ alone, the Virgin Birth, the Inerrancy of Scripture, etc. Both of us here at Sola Sisters have already lived through the futility of those beliefs.....only we did it as New Agers, not Christians. This is NOT orthodox Christian thought. Below is our original post in its entirety. Emergent Church leader and pastor Rob Bell has recently released a DVD titled "Everything Is Spiritual" that attempts to use quantum science to prove the idea that God is "in" everything. Why is this disturbing? Because Rob Bell, who is a pastor and professing Christian, is teaching something that is not the Christian view of God, but is in fact, the eastern view of the universe. And this view, at its core, reduces the transcendent God of the Bible to a kind of impersonal essence, vibration, or energy....much more in alignment with Buddhist thought than Christian thought. And exactly WHERE are the Emergents going with this God-as-impersonal-energy view they are teaching and attempting to prove with science? This "God" is much more in alignment with the non-threatening, interfaith "God" that is much more acceptable in today's culture of religious pluralism. "Facts are stubborn things," said former U.S. President John Adams. 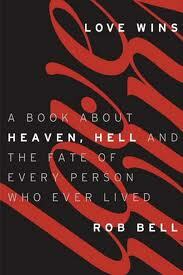 Which leads us to perhaps the biggest question in all this: is what Rob Bell teaching even true? Not according to Dr. Frank Stootman, a quantum physics professor in Australia who has written a paper scientifically refuting Rob Bell's attempt to make panentheism seem scientific. Dr. Stootman's paper states that Rob Bell's "science" is weak at best, and does not support his argument. Try as they might, the Emergent Church leaders cannot "scientifically" prove their case that God is an impersonal vibration or energy that permeates the universe - the panentheistic view - and a view they would vastly prefer. Vibration? Energy? Those are just natural laws - and require no response because they are, in essence, "neutral." But a God who is sovereign and transcendent over His creation does require a response: either repent of sin and come to him on his terms (through the blood of Christ)......or remain alienated from him, dead in sins, and under his wrath. This response of rejecting God as He has revealed himself in the Bible will result in eternal damnation. But oh how the Emergents shrink back in horror from this definitive view of a God who speaks authoritatively through his Word, and commands all men everywhere to repent. It seems the Emergents will bend over backwards - and even conjure up theories comprised of faulty science - in order to "craft" a "God" that is more desirable to them.